Seriously addressing climate risk requires reducing carbon emissions by at least 80 percent by 2050 in the U.S. and across all major economies. We find that meeting this goal is both technically and economically feasible using commercial or near-commercial technology. Shifting to a cleaner energy economy requires three major changes: switching from fossil fuels to electricity wherever possible; generating electricity with low or zero carbon emissions; and using energy more efficiently. These changes involve substantial capital investments up front, but these investments will be offset by fuel savings. Essentially, the shift substitutes up-front capital investment for long-term fuel spending. The investment needed to transition to a clean energy economy is likely less than either the economic costs of unmitigated climate change or the projected spending if the U.S. continues to rely primarily on fossil fuels. This level of investment is also comparable in scale to other recent investments that have transformed the American economy. For example, with advances in unconventional oil and gas production, investment in fossil fuel production has increased to an average of $130 billion per year over the past decade, from less than $30 billion in 2000. An average of $350 billion per year has been invested over the past decade in computers and software, more than tripling the annual investment levels of the early 1990s. These investments have yielded solid returns to those businesses willing to lead. These up-front capital investments would bring large reductions in fuel costs, because renewable electricity generation requires little or no fossil fuels, and electric vehicles and other new systems would bring major gains in energy efficiency. The savings would grow from an average of $65 billion per year between 2020 and 2030, to $400 billion per year between 2030 and 2040, and to an average of about $700 billion per year from 2040 to 2050. The higher levels of capital investment needed for the clean energy economy would boost manufacturing and construction in the U.S., stimulate innovation, and create new markets. Roughly 460,000 new construction jobs could be created by 2030, with the number rising to 800,000 by 2050. However, dramatically reducing the use of fossil fuels would obviously hurt industries and regions that now depend heavily on coal, oil, and natural gas. It could decrease the number of coal mining and oil- and gas-related jobs by more than 130,000 by 2030 and 270,000 by 2050, with job losses concentrated in the Southern and Mountain states. Transition assistance and job training would be needed to ease these economic dislocations. Because of regional differences in energy consumption and renewable energy resources, each region of the U.S. would see different amounts of job growth and industry gains. Wind power would grow fastest in the windy central region, and investments in solar power would be greatest in the sunny western and southwestern regions. Revenue from biomass feedstocks would be greatest in the Southeast and the Midwest. New nuclear plants would be concentrated in the mid-Atlantic and southern regions, where renewable resources are less abundant and the regulatory framework for vertically integrated utilities is more conducive to such plants. We modeled four distinct pathways that could achieve economy-wide reductions in CO2 emissions of 80 percent below 1990 levels, and compare results to a “business-as-usual” pathway we call the High-Carbon Reference Case. Three of these pathways each rely significantly on one of the three major types of low- and zero-carbon electricity: renewable energy, nuclear power, and fossil fuel power with carbon capture and storage (CCS). The fourth, labeled the “Mixed Resources” pathway, relies on a balanced blend of these three types of clean electricity. Each pathway also includes a different mix of low- and zero-carbon transportation fuels and technologies. 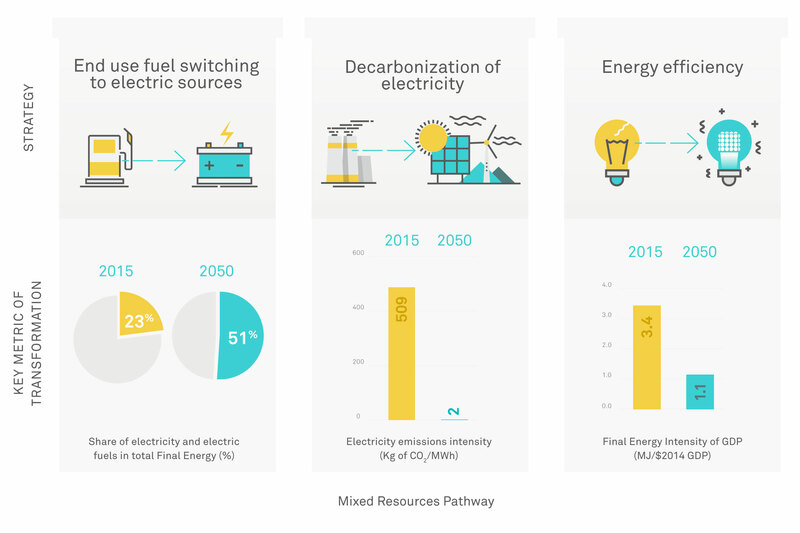 We focus primarily in this summary report on the results for the Mixed Resources pathway, but full results are available in the Appendix for the other pathways: High Renewables, High Nuclear, and High CCS. The Appendix also provides additional details on the design of the pathways. The Co-Chairs and the Risk Committee of the Risky Business Project do not endorse any one specific pathway. The transition to a clean energy economy is critical if we are to reduce risks from the impacts of climate change. It is also economically feasible and offers opportunities for many U.S. businesses. A widespread electrification of the economy, substituting electricity for fossil fuels1. A transition to low- and zero-carbon electricity generation sources and away from fossil fuels. Major progress in using energy more efficiently across all sectors. The share of electricity as a portion of total final energy use more than doubles, from 23 to 51 percent2. The remaining 49 percent comes from low-carbon biofuels (expand from 3 to 18 percent), and from direct fossil fuel combustion (decreasing from 74 to 31 percent). The CO2 emissions intensity of generating electricity decreases from 509 to 2 kg of CO2/MWh. The final energy intensity of GDP (reflecting energy productivity) decreases by about two-thirds, from 3.4 to 1.1 megajoules per dollar of GDP. This rate of change corresponds to a reduction in final energy intensity of about 3 percent per year, compared to a reduction of about 2 percent per year in the High-Carbon Reference Case3. Electrification of the Economy. Electrifying the economy, if electricity is generated with low- or zero-carbon sources, would significantly reduce CO2 emissions. Electricity would replace fossil fuels across a variety of end-uses. In buildings, electric heat pumps for space heating and cooling and water heating would replace oil and gas furnaces. Cars, light trucks and buses, and other types of vehicles would use electric battery drives to reduce gasoline use, with the additional benefit of lower maintenance costs. Hydrogen and synthetic natural gas produced from electricity could also come into the vehicle fuel mix. Electricity, hydrogen, and synthetic gas would also substitute for fossil fuels in many industrial applications. However, airplanes and many industrial processes are much harder to electrify, and therefore still likely to be largely powered by fossil fuels. Low- and Zero-Carbon Electricity Generation. Electrifying the economy achieves climate benefits only if the electricity itself is generated using low- or zero-carbon sources. These can come in several forms: renewable energy, nuclear power, and fossil fuel power with carbon capture and storage (CCS). Because of continuing innovation and declining costs for technologies like wind (the cost of wind energy has decreased 41 percent from 2009 to 2016) and solar (installed costs have dropped 64 percent since 2008), continued expansion of renewable energy is now both technically possible and economically feasible. Unlike some forms of renewable energy, nuclear power and CCS have not significantly decreased in cost in recent years; however, assuming improvements in cost effectiveness, both could provide sources of baseload power in the future4. Greater Energy Efficiency. The potential for improved energy efficiency—doing more with less—remains huge despite steady gains over many decades. A National Academy of Sciences study concluded that the U.S. could cost-effectively reduce energy use by 25 to 31 percent by 2030, applying discount rates ranging from 7 to 15 percent5. Indeed, many steps to improve energy efficiency, such as insulating buildings or upgrading heating and cooling systems, have energy savings over the lifetime of the investments that are far greater than the initial investment costs. Unfortunately, the payback periods and rates of return for these projects often preclude widespread adoption. Long-recognized problems of imperfect information, high transaction costs, and the misaligned incentives of principals and agents6 also pose obstacles to greater investments in energy efficiency7. Our modeling of clean energy pathways paid close attention to the useful lifetimes of many types of capital assets (Figure 2). In general, the cost of the transition to a clean energy economy would be lower if companies and consumers can avoid early retirement of capital assets. Consequently, each of our four pathways assumes average fixed asset turnover rates. For instance, hot water heaters, space heating equipment, and light-duty vehicles would be replaced two to three times between now and 2050. Longer-lived assets such as heavy-duty vehicles, industrial boilers, and some power plants would be replaced only once. Buildings last many decades and our modeling does not assume any replacements before 2050. It is important to note that companies and consumers sometimes hold onto capital assets longer than their average or recommended life, and that incentives may be required to keep to a recommended turnover schedule. Figure 2 presents the number of replacements that PATHWAYS assumes from 2015-2050. Modeling assumes that replacements of energy using equipment and facilities would occur on a timeline consistent with their normal turnover or lifetimes. Due to their long lifetimes, residential and other buildings are not replaced in our modeling. However, buildings’ HVAC, lighting, and other systems can be made more efficient. As-Spent Cost Estimates. This perspective looks at annual expenditures on capital and on fuel and other operating costs. Some refer to this as “cigar box” accounting. Total Energy System Costs. This perspective annualizes the capital costs over the lives of the investments, by translating these costs into a series of annual payments8. Then it combines those annualized costs with fuel and other operating costs. This perspective provides yearly cost estimates that are closer to what businesses will experience as they provide returns to equity and debt holders, and to what consumers will experience in energy costs and related purchases. Macroeconomic Impacts. A 2015 study using PATHWAYS and the macroeconomic REMI model9 modeled clean energy pathways very similar to those in this report. The projections of impacts on GDP and employment from that study are useful indicators of the macro impacts of our pathways, and are presented here. Below, we apply each of these three perspectives in examining the net cost to the U.S. economy between 2020-2050 of the transition to a clean energy economy relative to a “business-as–usual” scenario, which we call the High-Carbon Reference Case10. Our first perspective on cost can be viewed in terms of as-spent cost estimates. A clean energy economy would require substantial shifts—and major net increases—in capital investments, while reducing overall spending on coal, oil, and natural gas fuels and related capital equipment. Under our Mixed Resources pathway, net U.S. investments in new clean energy technologies (after subtracting avoided investments in fossil fuel power plants) would grow annually until roughly 2030-2035, and then plateau at $400 billion per year more than in the High-Carbon Reference Case (Figure 3). Fuel and investment savings would grow slowly but steadily offset these costs, exceeding clean energy investments by the mid- to late 2030s. By 2050, fuel savings alone would be about $800 billion annually. Spending on natural gas would increase through the mid-2030s, and then begin to decrease. These changes in investments and fuel costs affect both businesses (e.g., for power plants and associated fuel) and consumers (e.g., for vehicle and gasoline purchases). 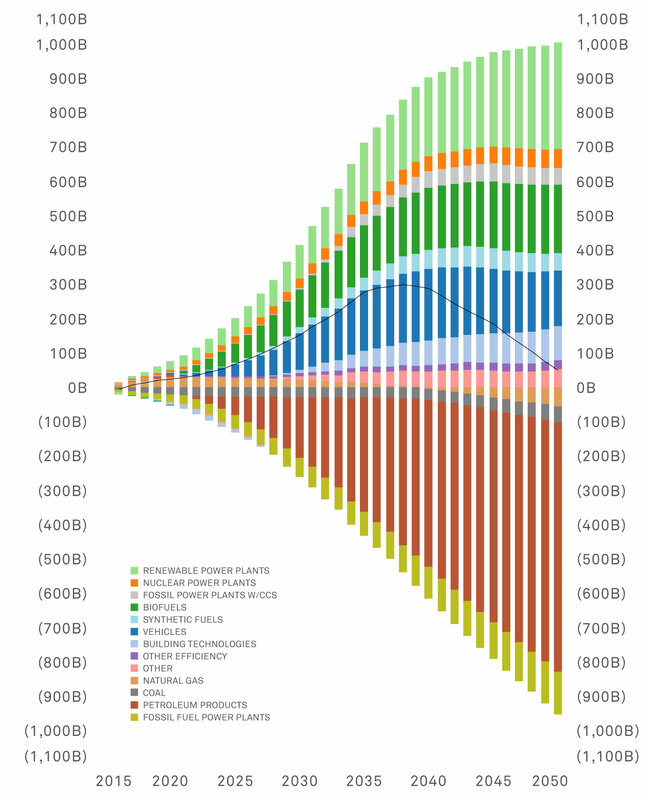 Figure 3 depicts the annual changes in as-spent investments and fuel expenditures in the Mixed Resources pathway, relative to the High-Carbon Reference Case. incremental investments in vehicles, buildings, other efficiency measures and other infrastructure (e.g., grid and pipeline expansion). • Fuel savings and decreased investments in fossil fuels resulting from taking the Mixed Resources pathway are shown as negative numbers in the lower portion of the figure. 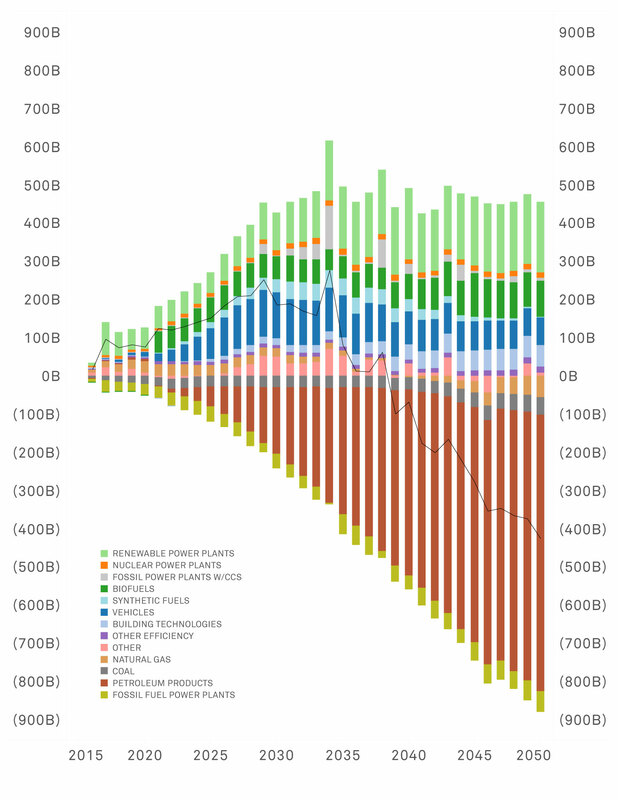 These include decreased investment in coal, petroleum products, and fossil plants without CCS. • The black line indicates the “as-spent” net cost, largely the difference between the clean energy investments and the fossil fuel savings from a simple ”cash drawer” accounting perspective (with relatively small changes in non-fuel operating costs also accounted for). Notably, a greater percentage of energy spending is likely to stay in the U.S. under any of our clean energy pathways. Today, more than 60 percent of the money America spends on energy is used to purchase petroleum products to fuel cars, trucks, buses, trains, and planes, and about one-quarter of that fuel is imported11. In a clean energy economy, the bulk of this spending will be redirected to clean power plants, production of hydrogen and synthetic gas, biofuels production facilities, biofuels feedstocks, and energy efficiency investments. Though some capital stock necessary for the clean energy transformation will likely be imported, overall a greater percentage of energy-related spending would remain in the domestic economy. The second perspective on cost is the “total energy system cost.” This viewpoint annualizes the investments over the lifetimes of the assets. Annualizing investments smooths out bumpy patterns of investment and can better reflect the actual cash flows (including interest) that businesses and consumers experience as they invest in or purchase power plants, new buildings, vehicles, and other facilities and goods. From this perspective, investment costs grow more slowly than in the “as-spent” perspective. The annual net cost associated with the transition to a clean energy economy (the change in total energy system cost) peaks in the late 2030s at less than $300 billion per year (Figure 4). In Figure 4, the black line indicates the net change in total energy system cost, estimated as changes in annualized investment costs plus changes in fuel costs. It also includes small changes in other operating costs. Individual cost components are the same as described for Figure 3. To put these numbers in context, total investments by government, businesses, and consumers currently exceed $3 trillion per year. The U.S. GDP is more than $18 trillion. The increases in investment needed for the Mixed Resources pathway would therefore increase annual economy-wide investment as a percentage of GDP by 0.4 to two percent over the period 2020-2050, with GDP growing to roughly $40 trillion in 2050. Total economy-wide investment would be 19-20 percent of GDP between 2020 and 2050, compared to 18-19 percent in the High-Carbon Reference Case. Our definition of investment includes business investments in plant and equipment, as well as incrementally higher costs for consumers in purchases of vehicles and appliances. Similarly, the conventional definition of economy-wide investment includes consumer purchases of new homes12. Similar increases in investment have occurred in other industries when opportunities are offered by market conditions and/or technology innovation. Over the past 15 years, for example, innovation in drilling and hydraulic fracturing technology led to increased annual investment in fossil fuel production, growing from less than $30 billion in 2000 to more than $170 billion in 2014. Fossil fuel investment increased to roughly 12 percent of total private investment, yet remained less than two percent of GDP as a whole13. The U.S. has also seen explosive growth in investments in computers and software. From 1980 to 1985, annual investments more than doubled, from $33 billion to $73 billion. Annual investment then topped $100 billion in 1990, $200 billion in 1997, $300 billion in 2000, and $400 billion in 2015. In total over the past 20 years, the U.S. has invested $6 trillion in computers and software. In similar fashion, U.S. investment in communications equipment and infrastructure stayed fairly level, at roughly $50 billion per year, until the early 1990s. With the creation of the Internet and cellular phones, growth increased, reaching $100 billion in 1998. Since 1994, the U.S. has invested more than $2 trillion in communications equipment and infrastructure. In yet another example, the Interstate Highway System was a major infrastructure investment totaling roughly half a trillion dollars (in today’s dollars), spread out over roughly four decades. Historically, investment has fluctuated between 16 and 21 percent of GDP, as some sectors grow and some sectors decline in their capital needs. ICF International estimated GDP and employment by using PATHWAYS and the Policy Insight Plus model, a macroeconomic model of the economy developed by the Regional Economic Models, Inc. (REMI). ICF used PATHWAYS output from a 2015 study conducted for the Deep Decarbonization Pathways Project (DDPP) that also had reduction goals for U.S. CO2 emissions of 80 percent by 2050 from 1990 levels. ICF used outputs from PATHWAYS (changes in energy use and investments) as inputs to the REMI model to project how those changes would affect the U.S. relative to the REMI reference case. Outputs included increased investments in constructing new electricity generation facilities, transmission lines, hydrogen and synthetic gas production facilities, electric vehicle charging stations, and hydrogen fueling stations, along with decreases in fossil fuel energy use and investment. The third perspective on cost examines macroeconomic impacts on GDP and employment. While less relevant to individual companies and investors, these impacts are of particular interest to policymakers working across jurisdictions and economic sectors. As noted earlier, PATHWAYS can estimate investment needs, fuel savings, and changes in total energy system costs. PATHWAYS is not a macro-economic model that explicitly forecasts GDP and employment, but there is additional literature that can provide insights into likely GDP and employment impacts. In 2015, ICF International conducted a study that provides a good indication of possible impacts on GDP and employment from our Mixed Resources pathways (see box above)14. ICF found that at the national level, GDP would increase by 0.6 percent above reference case levels in both 2030 and 2050 (by $157 billion and $199 billion respectively). The REMI model projected that employment would increase by 0.5 percent in 2030 and 0.4 percent in 2050. However, regional impacts would vary, and there would likely be winners and losers in the shift to a clean energy economy. ICF Incorporated, Economic Analysis of U.S. Decarbonization Pathways: Summary of Findings, November 15, 2015. Available at: https://nextgenamerica.org/wp-content/uploads/2015/11/ICF-Study-Decarb-Econ-Analysis-Nov-12-2015-Final3.pdf. Results for Mixed Resources pathway. Additional output details provided to Risky Business by ICF, and GDP adjusted to 2014$. These numbers must be put in context: for instance, some economists also argue that economies tend to gravitate toward full employment, meaning that long-term creation or loss of jobs from investments in one set of activities or sectors is unlikely. Moreover, the U.S. economy, and indeed the global economy, continues a profound shift toward mechanization and automation in general, including in some of the key manufacturing and construction industries discussed here. This shift will certainly lead to job losses across some industries accompanied by job growth in other industries, regardless of the direction of our energy investments. Keeping these larger economic trends in mind, the key takeaway from the ICF study is that a major substitution of electricity and capital for fossil fuels would have a small positive effect on GDP and employment. All economic modeling exercises of this nature have multiple layers of uncertainty. For instance, the modest but reasonable GDP growth rate in our High-Carbon Reference Case would lead to a $40 trillion economy in 2050. The REMI modeling indicates that shifting several hundred billion dollars annually away from fossil fuels and to clean energy would have a modest and positive effect on GDP. Positive macro-economic impacts are plausible for several reasons. Fewer dollars would go overseas for oil imports, and more dollars would remain circulating in the domestic economy. Construction, operation, and maintenance of power plants, and retrofitting millions of American homes with insulation and more efficient heating and cooling systems, would likely require a larger labor force than producing coal and oil. The labor needed to construct, operate, and maintain various facets of the clean energy economy would be domestic by nature. Trends in manufacturing jobs are more uncertain, as there are already global markets for power plant components, wind turbines, and solar PV cells. The market shares of U.S. manufacturers and the impacts on employment will be determined by many factors, including global supply chains and broader trends towards increased automation. Nevertheless, major technological transitions reward innovation and entrepreneurial risk-taking, which are key strengths of American business. The transition to a clean energy economy would have markedly different impacts on different sectors. This section examines impacts on five key sectors: electric power, transportation, fossil fuel exploration and production, manufacturing, and buildings. Electrifying the economy would create a major opportunity for utilities and other electricity providers by addressing one of their biggest problems: a stagnant market. Electricity demand was flat in the U.S. from 2007 to 2014, even as the economy grew eight percent in real terms15. That lack of growth has reduced revenues and bottom lines, causing layoffs and power plant retirements. Putting millions of electric and fuel cell vehicles on the road, switching to electricity for most heating and cooling, and using electricity to produce hydrogen and synthetic methane would roughly double electricity demand between now and 2050 (Figure 5). A clean energy economy could lead to a long period of growth for the utility industry. 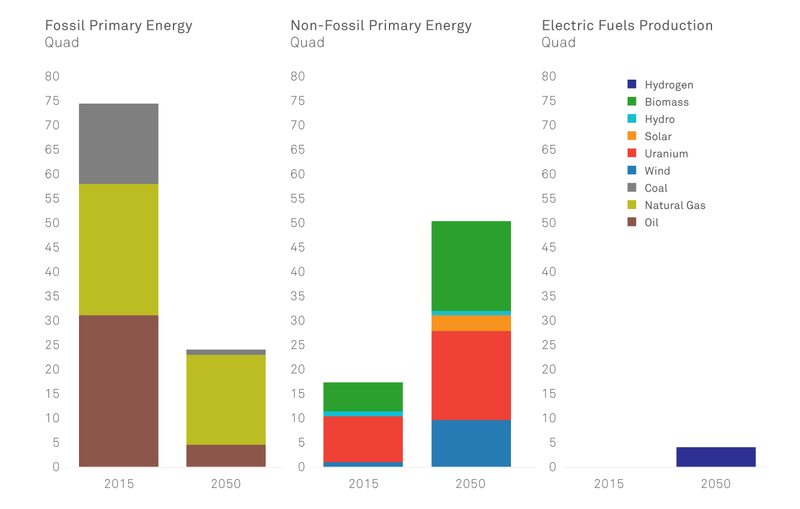 Figure 5 depicts total power generation and the mix of generating sources in 2050 in the High-Carbon Reference Case and the four clean energy economy pathways. In the Mixed Resources pathway, total electricity generation increases to nearly 8,000 billion kWh from a High-Carbon Reference Case level of roughly 5,000 billion kWh, more than doubling from today’s 4,000 billion kWh. Demand would increase as electricity replaces fossil fuels in vehicles, buildings, and industry16. In the High-Carbon Reference Case and High Renewables and High Nuclear pathways, fossil fuel power plants do not use CCS. In the Mixed Resources and High CCS pathways, the vast majority of fossil fuel power plants use CCS. Also, generation varies significantly across pathways due to variation in production of hydrogen and synthetic gas (see Transportation section). These added investments would also boost markets all along the power sector supply chain, benefiting polysilicon manufacturers, transmission line builders, inverter suppliers, and wind turbine maintenance firms, among others. There would also be many opportunities for innovation, such as new devices to reroute power on transmission lines; large-scale batteries and other energy storage technologies; smart meters in most homes and businesses; and sophisticated micro-grid technologies. Creating a low-carbon economy will likely accelerate the emergence of new utility business models, as companies increasingly sell energy management services instead of, or in addition to, selling electricity as a commodity. New and emerging markets include managing demand response services, conducting energy audits and retrofits, developing new smart grid technologies, and building and operating charging networks for electric vehicles. In addition, one major trend is rapid growth in distributed generation in the form of community solar plants and rooftop solar on homes and commercial buildings. Distributed generation is perceived as a threat to the traditional utility model of large centralized power plants, but some utilities are seeing opportunities to invest in and/or own such distributed capacity17. There is a rich literature on the challenges and opportunities for the power sector in a clean energy transition. We discuss these in Section 3 and in the Appendix. Electrifying the economy is an ambitious goal. Timing is critical. Conventional power plants typically operate for 30-60 years or more once they come online (depending on the type of plant and the regulatory framework they operate in), which means that decisions made today will shape the U.S. electricity system at mid-century and beyond. The transportation sector would experience perhaps the largest shift in the clean energy transition. Multiple vehicle types and their manufacturers, including businesses operating across the transportation sector supply chain, have the opportunity to move away from traditional fossil fuels and toward electricity, biofuels, or other low-carbon fuels. There is also an opportunity to redesign cities to prioritize public transit and new technology solutions such as shared vehicles and rides, autonomous vehicles, and inter-city rail, all of which could reduce vehicle ownership and GHG emissions. All of these are important parts of the transportation transformation; however, we focus here on light-duty cars and trucks, because they are responsible for 16 percent of U.S. GHG emissions18 and present major economic opportunities for innovation in manufacturing and deployment. Figure 6 depicts how the four pathways would meet transportation demand in 2050. The four pathways exhibit a diverse mix of low- and zero-carbon fuels, while all retain liquid fossil fuel components for aviation and freight transport. All four pathways increase the efficiency of vehicles and other transportation modes so total energy use is less than 15 quads (quadrillion BTU) per year. In each pathway, electricity plays two roles in different proportions: 1) charging batteries in electric vehicles, and 2) producing hydrogen and synthetic methane gas. A clean energy economy would create a mixture of opportunities and risks for vehicle manufacturers. There are more than 250 million cars and light trucks on the road in the U.S. and millions more buses and tractor-trailer trucks. The transition described in our modeling would require auto manufacturers to redesign their offerings and retool their assembly lines. Given vehicle lifetimes, the current light-duty vehicle fleet could turn over two to three times between now and 2050, while the heavy-duty fleet will likely turn over only once. All of our pathways envision a major transformation for vehicles within the transportation sector, including a very different and diverse mix of vehicle technologies, fuels, and fueling infrastructure than currently exists. In particular, the transportation transformation would require that the transportation and power sectors become much more integrated. Our modeling explored four diverse pathways that reflect this integration. In the High Renewables pathway, for example, surplus power would be used to charge electric vehicles and produce synthetic methane for heavy-duty vehicles. In the High Nuclear pathway, excess generation would be used to produce hydrogen for fuel cell vehicles. Over time, our modeling assumes that electric vehicle battery costs would decrease and driving range would increase; it also assumes that more charging stations would be installed. This transition could create significant opportunities for vehicle manufacturers that make early investments in electric and hybrid vehicles. 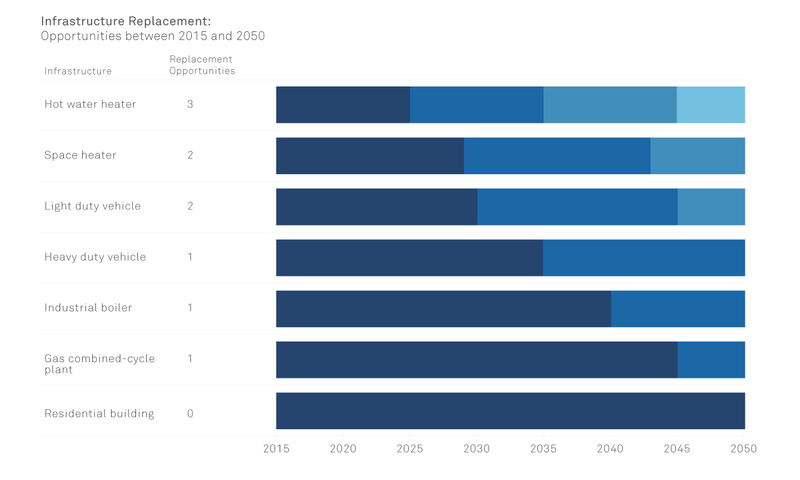 In fact, electric drive vehicles—including battery electric, plug-in hybrid, and potentially fuel cell vehicles—are projected to become a $430 billion to $550 billion annual market by 2030 in our Mixed Resource pathway. Our modeling shows the average low- or zero-emissions vehicle initially would be more expensive than today’s average gasoline-powered vehicle. For example, PATHWAYS assumes that in 2020, an all-electric car would carry a price premium of roughly $10,000 over a conventional car. The price premium for an all-electric light truck would be roughly $15,000. Over time, our relatively conservative modeling assumes the price premium for electric vehicles would decline as vehicle manufacturers move up the learning curve and achieve economies of scale in production. By 2030, the price premiums would be roughly $4,000 and $8,000 for all-electric cars and trucks, respectively, and by 2050 the price premium would be essentially zero. As with the energy transition as a whole, initial investment in these vehicles will ultimately be offset by lower fuel costs19. As with the overall energy transition, the transportation transformation will create opportunities and challenges for various businesses. For example, electric vehicles could pose a major challenge to the business model of auto dealers and auto repair shops, which rely heavily on maintenance and repairs for their revenues and profits. Electric cars do not require oil changes or many other routine maintenance measures. Brakes also last longer because of regenerative braking. At the same time, widespread switching from liquid fuels to electricity would mean that many of today’s parts—e.g., camshafts and catalytic converters—would become niche products, while the U.S. would see the rise of companies focused on new components such as electric motors, batteries (and/or fuel cells), electricity management systems, and charging stations. More difficult to predict are the opportunities that may arise from changes in the future roles and capabilities of the automobile. Our modeling retained the assumption from a U.S. government forecast of modest growth in vehicle-miles-traveled per capita out to 205020. However, there are signs of shifting preferences to live in cities rather than suburbs, which would likely increase demand for public transit. Increased investment in, and use of, public transit could serve a greater portion of all urban and suburban mobility needs in the decades ahead. There are other possible trends that could reshape how we supply personal mobility: Will cars increasingly become part of a shared service instead of a privately owned product? Will driverless, or autonomous, vehicles become the norm? The emergence and growth of Autonomous Vehicles (AVs) could alter the timing of changes in the composition and performance of the light-duty vehicle (LDV) fleet, which would, in turn, affect investment costs, electricity demand, and final energy demand. Many companies are already working to create visions of a different transportation future, as companies test self-driving vehicles, invest in ride-hailing companies, and create new car-sharing services21. A truly different transportation system of this sort has the potential to significantly reduce the cost of mobility and the total cost of transitioning to a clean energy economy. Electricity is not the only alternative fuel in our models. We also look at the potential for biofuels to replace fossil fuels in specific cases. This is not a new idea: Biofuel in the form of ethanol is currently added to gasoline, providing roughly 10 percent of the total volume sold22. Our modeling shows that biofuels could supply key fuel needs in the clean energy transition, e.g., for tractor-trailers and airplanes, which are difficult to electrify using current technology. Our pathways include use of renewable diesel and biogas made from non-food sources, such as agricultural waste, municipal waste, and dedicated energy crops such as switchgrass (when grown on lands not in agricultural use). Use of such non-food sources reduces the controversy that surrounds ethanol made from corn, because they do not compete with land dedicated to food production. However, there are significant environmental and economic concerns about increasing the use of biofuels, and current market trends are not encouraging23. Any major expansion in the electricity sector with an eye toward electrification of the economy will necessarily be paired with major contractions in the coal mining and oil and gas industries. Businesses that are directly dependent on coal mining and oil and gas production will see economic contraction and job losses. Notably, however, fossil fuels could still play a limited role in a clean energy economy (Figure 7). For example, the High CCS pathway would preserve a role for fossil fuel generation, while sequestering 90 percent of the associated CO2 emissions. Aviation would still rely on jet fuel, while natural gas would retain a role in power generation, industry, and transportation, whichever path we choose. Nevertheless, as the demand for fossil fuels declines, some businesses will shrink or exit the market. Strategic companies have the opportunity to adapt and grow—for instance, some oil and gas firms are already investing in CCS, biofuels, and other advanced technologies that are essential to a clean energy economy. Figure 7 depicts the transition away from fossil fuels in the Mixed Resources pathway. Use of coal, oil, and natural gas decreases from the current combined level of about 75 quads to less than 25 quads. In this pathway, coal use in the energy system would be nearly eliminated by 2050. Oil consumption would decrease substantially, as electricity, hydrogen, synthetic gas, and biofuels replace gasoline and diesel use by vehicles. Significant use of natural gas would continue, mostly in industry and power generation. The additional capital investment inherent in a transition away from fossil fuels will create opportunities for American manufacturers. It would increase demand for many material components, equipment, and products, such as concrete, steel, wind turbine blades, transmission wire, solar panels (and mounts), heat pumps, LED lighting, and batteries. Many of these goods could be manufactured domestically, especially if domestic demand increases to provide large markets for these products, and if new carbon emission-reduction policies in the U.S. or elsewhere include protections to ensure we are not meeting the needs of the clean energy transition with goods made in countries that have not adopted similar policies. In addition, there is increasing evidence that as manufacturing becomes more advanced, it is more important for firms to locate near the source of product innovation24. Today, the U.S. is the global leader in clean technology innovation, based on venture capital investment and patents held25. 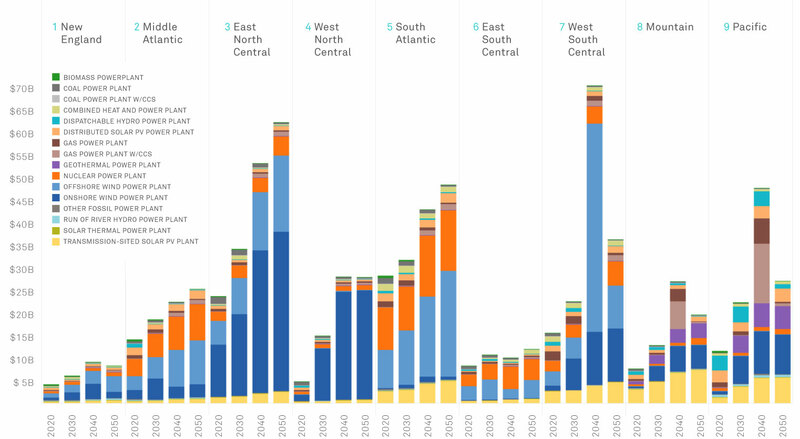 Moreover, the earthquakes in Japan in 2016 that disrupted the supply chains of Toyota and others are reminders that natural disasters, including increased climate impacts from sea level rise and increased heat, may require manufacturing to move closer to innovation and markets as part of an overall risk-reduction strategy. Manufacturers are also major energy users. But our modeling shows that energy-intensive industries would see small changes in overall energy demand and fuel mix under a clean energy transition, because most U.S. firms are already relatively energy efficient. In addition, some high-temperature processes cannot be fully electrified, though some fuel switching is still possible: In iron and steel production, for example, electric arc furnaces could further expand their share of production, reducing the share of basic oxygen furnaces (thus reducing use of coking coal and refinery gas intensive processes common for basic oxygen furnaces) and allowing for increased replacement of new steel production with steel recycling. Some heating and steam production could also be electrified in a number of energy-intensive industries. In a transition to a clean energy economy, total energy use in buildings would decline while electricity would play a larger role in heating and cooling26. Currently, buildings represent about 40 percent of total U.S. energy demand, split about equally between direct fossil fuel combustion and use of electricity. In the Mixed Resources pathway, total energy use in buildings would decrease by slightly less than half (from 21 to 14 quads) despite economic and population growth, while the fossil fuel portion would decrease to 3 quads, from 10. Electricity would replace natural gas for most building uses, such as space heating and water heating. Meanwhile, energy efficiency would increase substantially through improvements in lighting (e.g. LEDs), building insulation, and efficiency of heating, ventilation and cooling (HVAC) systems and appliances. By 2050, the electricity use as a share of total building energy use would increase to more than 75 percent. Utilities are finding better ways to help customers improve energy efficiency in existing buildings27. For new buildings, the challenge is to incorporate maximum efficiency—and perhaps power generation—in the initial design and construction. Efficiency improvements in buildings can catalyze job creation and stimulate innovation along the entire supply chain28. Building materials are often manufactured near where they are used (rather than being imported from overseas), which would tend to keep more money in local economies; building efficiency projects also create significant construction jobs for local workers. Just as most economic sectors will see specific challenges and opportunities in a transition to a clean energy economy, regions will also experience the transition differently. Energy is fundamentally a local issue, and will become even more so in a transition away from fossil fuels that are shipped from concentrated geological deposits in particular states, to a system of more locally-generated renewable energy sources. 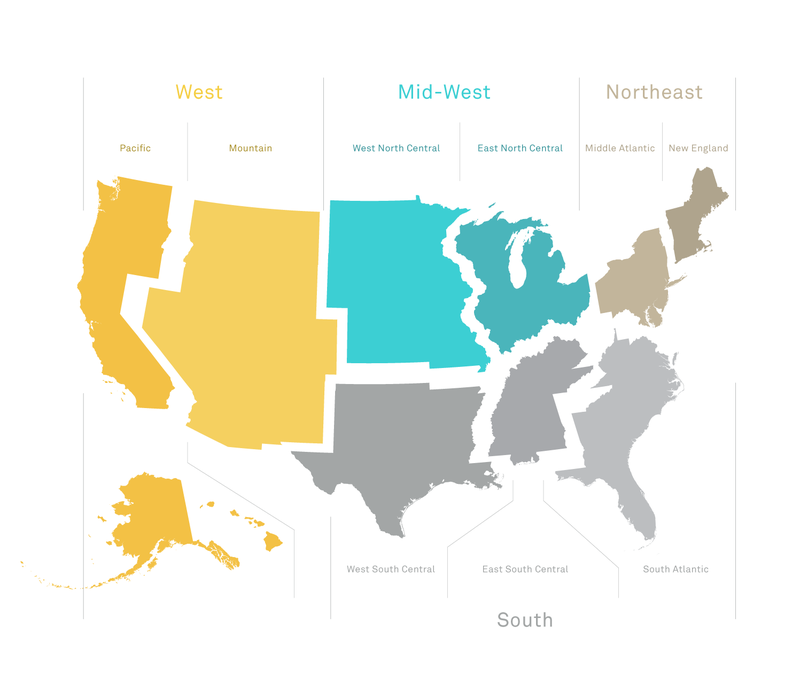 PATHWAYS provides output for both the U.S. as a whole and for the nine U.S. census divisions, offering insights into how specific states may experience the clean energy transition. The above example (Figure 9) relates specifically to the Mixed Resources pathway. It highlights different opportunities across the census regions. For example, new nuclear plant additions would be concentrated in the mid-Atlantic and southern regions, where the regulatory framework for vertically integrated utilities is more conducive to such plants. Wind power would grow fastest in the windy central region, and investments in solar power would be greatest in the sunny western and southern regions. Revenue from biomass feedstocks (not shown in the figure) would be greatest in the Southeast and the Midwest. 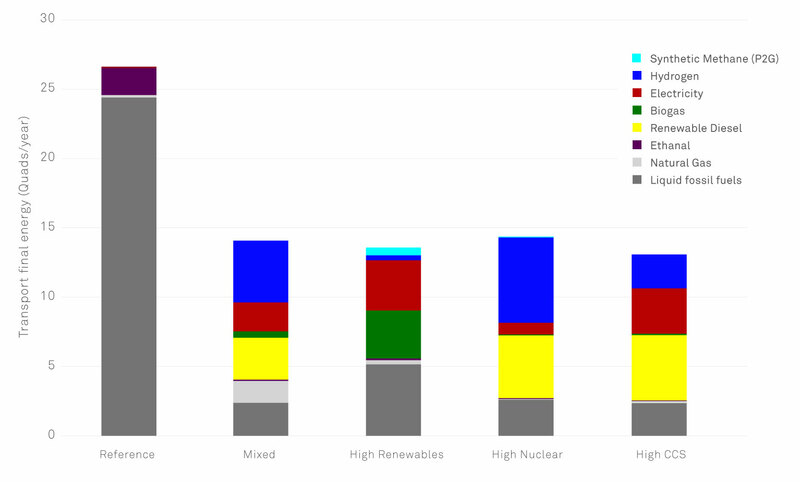 Figure 9 presents power generation investments by type and by region from 2020-2050 for the Mixed Resources pathway. Our modeling shows regional investment rather than the macro-economic impacts on jobs or regional economies of a clean energy transition. To better understand the latter we used the 2015 ICF study cited earlier. This study shows that seven of the nine regions would experience positive effects on GDP and employment in a very similar Mixed Resource pathway. The two exceptions are the West South Central and Mountain regions, which represent a large share of current U.S. fossil fuel production. ICF estimated that employment would decrease by 0.1-0.6 percent relative to the Reference Case in 2030 and 2050 in the West South Central and Mountain regions where those industries are concentrated. ICF International, Economic Analysis of U.S. Decarbonization Pathways: Summary of Findings, November 15, 2015. Results for Mixed Resources pathway. Additional output details provided to Risky Business by ICF, and GDP adjusted to 2014$. ICF International, Economic Analysis of U.S. Decarbonization Pathways: Summary of Findings, November 15, 2015. Results for Mixed Resources pathway. Additional output details provided to Risky Business by ICF. Climate risks and impacts will also vary according to geographic locations, and will have different impacts on regional energy needs. For example, the Southeast and Texas in particular will experience an increase in electricity demand due to an increase in air conditioning use in periods of extreme heat by the middle of the century, a factor that is not accounted for in our modeling. Our analysis of the direct economic consequences of a transition to a low-carbon, clean energy economy, including direct job benefits, only represents part of the overall impact. The transition also brings important co-benefits. Holding global temperatures down by cutting emissions worldwide would significantly reduce the risks—and the costs to business—from extreme weather, rising seas, and the other physical impacts of climate change. Our 2014 research found that these impacts will have significant economic consequences if the U.S. continues on its current high-emissions path. For example, the incidence of extreme weather is expected to rise. By mid-century, the number of days with temperatures greater than 95°F is expected to triple compared to a 1981-2010 baseline. While extreme heat both would threaten public health and reduce the productivity of outdoor workers, it would also lead to rising demand for electricity for air conditioning. Our 2014 report looked at the risks posed by climate change to only a few key sectors, not to the economy as a whole. Other economists have argued about the magnitude of the costs of not acting to curb climate change, with estimates ranging as low as 0.25 percent of GDP (about $45 billion for the U.S.) to as high as 20 percent of GDP ($3.6 trillion) if average temperatures rise by 4.5 to 5.4 degrees Fahrenheit (the differences are driven mainly by different assumptions about discount rates)29. Another analytical approach has been to try and calculate the actual cost of continuing to produce GHG emissions at current rates, which would include health impacts, shortened lives due to pollution, and a host of other economic and social factors. These numbers vary due to assumptions about the speed and scale of technology advancement, the adaptation rates of various industries to change, the discount rate used in the analysis, and other factors. But what is clear is that overall undiscounted costs in the future, and thus the benefits of emissions reductions, are very large. Building a clean energy economy is likely to improve the health of American citizens. A recent analysis by researchers at Duke University and the NASA Goddard Institute for Space Studies estimates that cutting GHG emissions (and thus pollution from fossil-fuel burning) could prevent 295,000 premature deaths in the U.S. by 2030. Near-term annual health benefits are estimated to be $250 billion per year30. Replacing coal, oil, and natural gas with clean electricity would also have non-climate related environmental benefits. Those benefits include fewer oil spills; fewer incidences of mercury contamination from coal combustion or contaminated streams from coal mining; and reduced chances of groundwater pollution or induced earthquakes from hydraulic fracturing and waste injection wells associated with gas drilling. On the other hand, low-carbon energy can also have environmental costs. These include radioactive waste associated with nuclear power and the mining of rare-earth minerals for solar panels, wind turbines, and electric car batteries. However, these potential negative impacts are likely less severe than the well-documented, and already observed, effects of conventional air pollutants. They can also be addressed over time with technology improvements.